Update: I just found out that the restaurant is Coppelia, which considers itself more Cuban than Mexican - or Nuevo-Latino, though there are plenty of Mexican items on the menu. They're in Chelsea, for those curious about trying huevos rancheros, chocolate dipped churros, yerba mate shortbread, blue corn meal pancakes, enchiladas, and yucca croquettes filled with beef picadillo. 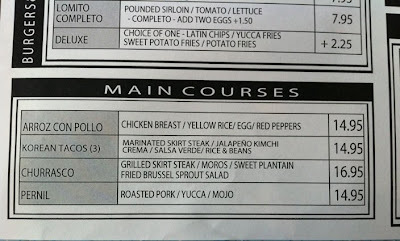 Spotted at a restaurant in New York: one of these main courses is not like the others. It's trendy right now to fuse Korean food with Mexican - in New York City, a food truck called Korilla (pronounced "Korea" to rhyme with "tortilla") serves burritos and tacos filled with bulgogi plus a side of kimchi. Belly Shack in Chicago serves tofu, chicken, or bulgogi on a crispy plantain and adds tortilla chips to one of their salads. 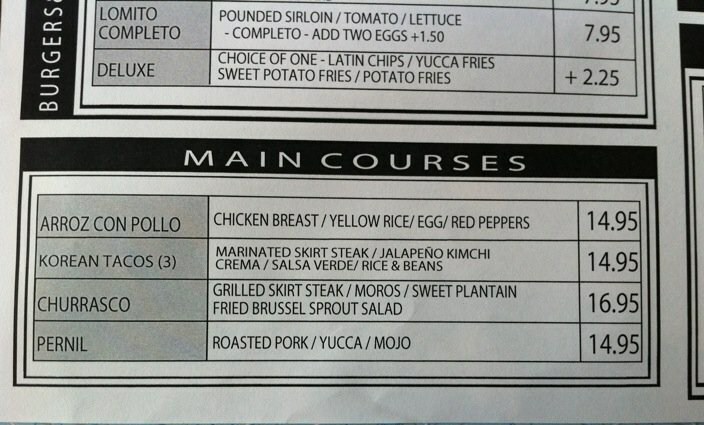 I guess the Mexican chefs decided that it's time to fight back with their own creations. Food wars! The winners? You and me, of course. Thanks to Justin Dombrowski for the photo and NYC news.